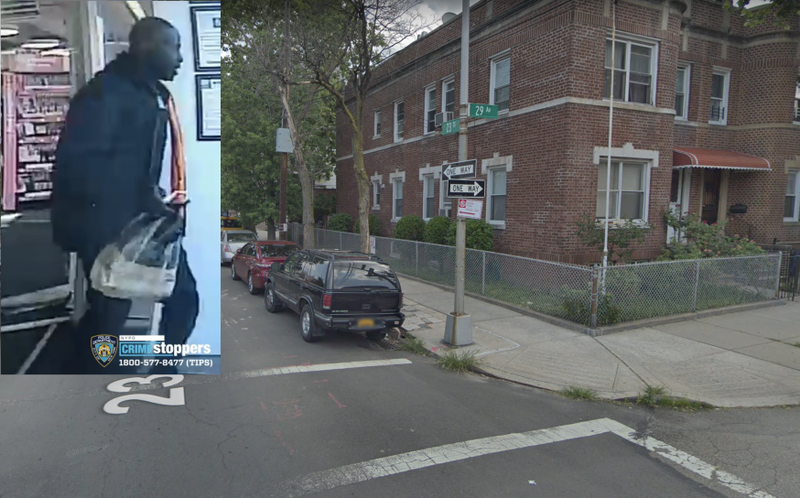 Police are searching for an individual who robbed a 75-year-old man in broad daylight on an Astoria street last week. Police say the suspect approached the victim in front of his home in the vicinity of 29th Avenue and 23rd Street on March 26th around 3:25 p.m. The suspect demanded the 75-year-old’s money, before stealing $30 and his bank cards. He then fled the scene. Police describe the suspect as being black and wearing a black jacket with an orange liner. even horses during the Summer, now not much of anything. WE have a problem in the 114. Stolen mail from mailboxes, people getting robbed, houses getting robbed. We need more cameras on the streets and more police presence at least until this is under control. There is no sense of community in Astoria anymore. Developers, restaurants and shops are busy catering to “temporary” rental residents and criminals are not afraid to roam our streets anymore because they know people are oblivious. There is a lot more crime happening in Astoria that doesn’t make the news and/or is under reported. In the past, most that purchased homes around here were looking to make a life here, raise children and cared. Nowadays most that buy live elsewhere and rent it out. – How would a restaurant cater to temporary residents? Another one of Obama’s people. Not surprising. Pat Macnamaracist isn’t it past your curfew at the nursing home? Shouldn’t you be calling mom and dad for more rent money because your barista job isn’t enough to pay rent? What barista job? You know they are on section 8 and on public assistance. Erroneously. Really fresh barista insult from 10 years ago. Next do one about skinny jeans! Maybe call your grandson and find out what insults have been popular in this decade. What are you implying: that people who can afford these “expensive buildings” are out robbing senior citizens of $30?? What they are implying: Criminals are aware of the influx of hipsters who aren’t street smart in which they can be easy targets. Try to keep up with us… The richy rich buildings entice the lowlifes to come here because the residents obviously have money and high end possessions. That’s why and that’s how. Except this was a 75 year-old man, not a “un-street smart” hipster nor a (assuming) “richly rich” new resident. It’s like shopping for a product. If the store doesn’t carry the brand you are looking for, you’re gonna get a different brand, no? Oh ok. Except I never mentioned anything about until street smart hipster or new resident. Stay in this world, please. People need to learn to defend themselves. At least purchase pepper spray. Sabre Red will turn anyone’s day into the worst day they ever had. I carry two in case one fails. You try to rob me, you’re going to the hospital. And that’s if I can contain my anger which will be the biggest challenge. How 80 y. old man can fight with the 20 + y .old, probably career criminal???!!! There is a saying “rather be judged by twelve than be carried by eight”. This old person will be carrying pepper spray. If I end up in jail, at least I will be alive! Pepper spray illegal? So is mugging and beating up on old people! Another saying “ God helps those who helps themselves”. Don’t expect the 114th precinct to do anything. They’re the do nothing cops. They can’t get too far away from Dunkin’ Donuts and Starbucks. I hope the gentleman wasn’t hurt, but the fact that this sewer sludge who is roaming the streets robs an older man, is disgusting. I hope they find him and put him in jail forever – away from decent human beings. According to the commander of the 114th precinct “there is no crime in this neighborhood “. One street mugging (however unfortunate) does not equate a crime wave. Not all crimes are reported. Please go to the 114th-a complete waste of time. Astoria is in a sharp decline. But please keep your head in the sand. We need more police patrolling our streets. FINALLY we can identify the perps color…….Ohbahma is not the prezident anymore so we can be honest about it. Did Astoria Post not post the perps race when Obama was president, or it’s just Rikki spouting off more racist nonsense again? What is going on with Astoria and why is the crime rate becoming so high???? Where is the police protection? I remember seeing cops drive up and down Steinway, even horses during the Summer, now not much of anything. WE have a problem in the 114. Stolen mail from mailboxes, people getting robbed, houses getting robbed. We need more cameras on the streets and more police presence at least until this is under control. We need fewer illegals roaming the streets. Their nations are such complete cesspools that the thought of several months in Rikers with the rest of their people is a vacation. We have soft-minded liberals who insist on defending their rights instead of the honest citizens subjected to this. But we can’t state this as we will offend people. So let the crime spree begin. With warmer weather on the way expect the worst. Any comments from our elected officials? Pat Macnamaracist why didn’t you blame the bike lanes tho? Spring is in the air. For past couple of years whenever we read/hear stories about crime every week in Astoria it is because the weather is getting better. Have a great summer! Yeah, we really need to expand the police state. Crime is down. Astoria is safe. Nothing to worry about here. you need a spiritual solution to your misguided anger. perhaps you should attend some 12 Step meetings to get your life back on track. Substance abuse is no excuse. I will pray for you.